An allergy is an overreaction of the body’s immune system to a typically harmless substance. A person without allergies will have no reaction to such substance, but when a person who is allergic to the substance encounters it, the body reacts by releasing chemicals which cause allergy symptoms. Nasal allergy symptoms can be triggered by substances such as pollen, mold, dust mite, animal dander and environmental irritants such as smog and climate factors. 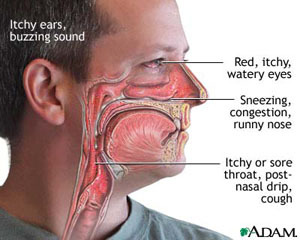 Nasal Allergies occur in up to 30% of adults and up to 40% of children. In the US, the prevalence of allergies has been increasing since the early 1980s. Experts estimate that allergies affect as many as 40 to 50 million Americans. Pollen allergies are one of the most common chronic conditions in the US. During an allergic attack, antibodies, primarily immunoglobin E, attach to mast cells (cells that release histamine) in the nose, lungs, skin, and mucous membranes. Once immunoglobin E connects to the mast cells, a number of chemicals are released. One of the chemicals, histamine, increases secretions, promotes itching, and causes the membranes to swell. The "allergic salute," a line across the nasal bridge caused by an upward rubbing of the palm of the hand on the nose. It is common for patients not to seek treatment for their nasal allergies because they consider their symptoms to be an annoyance that they just have to tolerate. Although there is no cure for nasal allergies, there are many safe and effective treatment options that can help manage nasal allergy symptoms. Each treatment has benefits and drawbacks. Reduce the amount of pollen and other allergens in your hair and skin by showering before bedtime. Limit pollen exposure on dry, windy days by keeping windows and doors shut. Reduce the amount of mold in the house by removing houseplants and frequently cleaning shower curtains, bathroom windows, damp walls and areas with dry rot and indoor trash cans. In addition, you can reduce the amount of mold in the house by avoiding carpeting bathrooms or other damp rooms of the home and using mold-proof paint instead of wallpaper. Cat or dog dander often collects in the house dust and takes 4 weeks or more to subside. Reduce the amounts of pet dander in the home by using allergen-resistant bedding, bathing your pet frequently, and using an air filter. Removing drapes, feather pillows, upholstered furniture, non-washable comforters and soft toys from the home. Replacing carpets with linoleum or wood and keeping the floors polished. Mopping the floors often with a damp mop and wiping surfaces with a damp cloth. Vacuuming the carpet regularly with a machine that has a high-efficiency particulate air filter. Vacuuming upholstered furniture and curtains as well as floors. Installing an air cleaner with a high-efficiency particulate filter. Washing all bedding in hot water (hotter than 130°F) every 7 to 10 days. Antihistamines help block the action of histamine, the substance produced by our bodies during an allergic reaction. They help reduce the sneezing, runny nose and itchiness symptoms that allergies cause. Although antihistamines are most useful when used prior to exposure to allergens, they are also effective in reducing symptoms once the body is exposed. There are many antihistamines to choose from. They come in the form of pills and nasal sprays, and some are available over-the-counter, while others require a prescription. Side effects of antihistamines may include drowsiness and dry mouth. The extent of these symptoms may vary depending on the type of antihistamine and the dose used. Decongestants fight nasal congestion by temporarily constricting the blood vessels. By reducing the size of the blood vessels, the nasal mucosal swelling, and therefore the nasal congestion, is reduced. Decongestants are available in pill form as well as nasal sprays. Please be aware that over-the-counter nasal decongestant can cause a “rebound effect” when used longer than the recommended period. This results in worsening of the nasal congestion after the medication has been stopped. In addition, decongestant pills may increase blood pressure and heart rate. Decongestants should not be taken without first checking with a physician if the patient has heart disease, high blood pressure, prostate problems, diabetes, or thyroid problems. Over-the-counter saline nasal sprays help reduce nasal congestion. They are effective, safe and nonirritating. Saline nasal sprays provide moisture to the nasal passages, especially during cold or dry seasons. When the nasal passages are dry, stagnation of mucus and mild nasal crusting may occur. Thus, inhaled allergens may not be cleared from the nasal passages in a timely fashion. Saline sprays clean the nasal passages of allergens, crusts and mucus and also help the natural cleaning system of the nasal passages. Inhaled nasal steroids, or corticosteroids, are inhaled nasal sprays that treat nasal allergy symptoms. They do not cause a “rebound effect.” They reduce the reaction of the nasal tissues to inhaled allergens. This helps relieve the swelling in the nose, thus reducing the congestion. It may take up to a week to notice the benefits of these steroid sprays. The goal of allergy shots is to "train" the immune system over time to be better able to tolerate the allergens that trigger the symptoms. Allergy testing is used to help identify the specific allergens that are causing the reactions. Allergy shots contain small amounts of these allergens and are given on a regular schedule so that the body gets used to the allergens and no longer overreacts to them.